If you know anyone in need, please forward this useful information from FEMA. AUSTIN, Texas – Temporary housing units are rolling out this week to eligible Texans whose homes were severely damaged or destroyed during the recent wildfires, officials from the state and the Federal Emergency Management Agency (FEMA) said Tuesday. Several dozen manufactured homes have been brought to Texas for eligible wildfire survivors and their families. To hasten the recovery process, the temporary units will be placed as close as possible to the location of the homes survivors are rebuilding or repairing. Eligible households are being identified based on a need for temporary housing while their primary residence is undergoing construction. The manufactured housing units are part of a larger state/FEMA housing program that uses several resources to house eligible residents displaced by wildfires that occurred on or after Aug. 30. While rental homes and apartments are preferred, the temporary housing units will provide a short-term answer for some displaced Texans. The temporary units will be placed in areas where the demand for rental homes and apartments far outstrips the supply. Because of the extent of the destruction in Bastrop County, eligible survivors there are likely candidates for manufactured housing. Units will also be placed in other counties affected by wildfires as the need is identified, said the Texas Division of Emergency Management and FEMA. The units will be provided for up to 18 months from the Sept. 9 declaration date, in atoledo accordance with local directives, as the final option in areas with limited available rental housing. Two types of housing units are available. Park models are 12-by-34 feet, with two bedrooms and one bathroom. 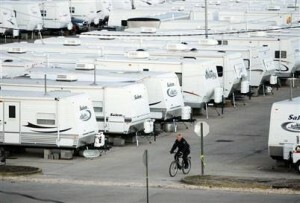 Mobile home models are 14-by-60 feet, with three bedrooms and one bathroom. Each version has a model that meets the Uniform Federal Accessibility Standards for people with disabilities, such as lower light switches and sinks, wider hallways and other features required for accessibility. After arriving in Texas from Selma, Ala., and Baton Rouge, La., the units are inspected and prepared for occupancy. They are then moved to survivors’ property, if feasible, or pads in commercial mobile home parks in designated counties. The units come fully furnished and move-in ready, with a stove, refrigerator and a microwave oven. Furnishings include a dining set, living room set, beds and chests of drawers. The units are built to meet or surpass stringent safety and air quality specifications issued by the U.S. Department of Housing and Urban Development. All units, including furnishings and appliances, are new and built to quality and workmanship standards that are higher than those mandated by law. Each FEMA temporary housing unit has been tested and passed an indoor air quality test to verify compliance with air quality standards established by Texas. Safety features include interconnected smoke alarms, a NOAA Weather Radio and a fire extinguisher. The units will be made available to eligible registered survivors. Texans can register online at www.disasterassistance.gov, via web-enabled phone at m.fema.gov, or by calling 1-800-621-3362 or TTY 1-800-462-7585. Those who use 711-Relay or Video Relay Services can call 1-800-621-3362. FEMA phone lines are open 6 a.m. to 9 p.m. seven days a week, and multilingual operators are available.